I hope my millions dozens of readers are having a good holiday thus far. Christmas is done with only the New Year fast approaching now. I have had some free time lately to catch up on various things I haven't had the time to do in months. Editing (various projects) is something I enjoy, sometimes I get absorbed in it, and sometimes I just can't find the motivation/inspiration to even begin. That said, I'm introducing a brand new addition to my website, called CG edits. I meant to put it up along with the renovation a while back to my website and even almost ended-up calling it Weekly Edit. I realized I couldn't nor didn't want to fulfill that responsibility every week so I held off on that section. I'm not sure how often I'll be posting these CG edits but I'll try to get one in every so often. I started by uploading a mind-boggling three images to begin with into a gallery page, and it will only grow from there. 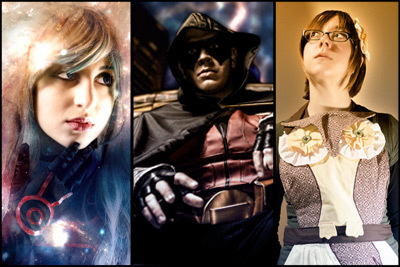 From left to right, cosplayers are Tamar, Jay, and the lovely Alex. These edit sessions will also let me get back into the photoshop groove. I haven't been using it much over the past 2/3 years, so I'm expecting some XP points shortly. I must've gained at least 45 doing these three images alone! Let me know what you think or if there's something you'd like to see in the future. So enjoy your holidays the best you can, keep an eye on the gallery for silent updates, and we'll see you in the 2013 year, seeing as we succesfully made it through Dec 21 unscathed, except my broken nail *screams*.